This is a piece of gear that's been seen at the crag more and more over the last few years. At first I scoffed at their goofy appearance, but when I got a chance to use them in Indian Creek last fall I was convinced. They're still goofy, but they make me a better belayer. 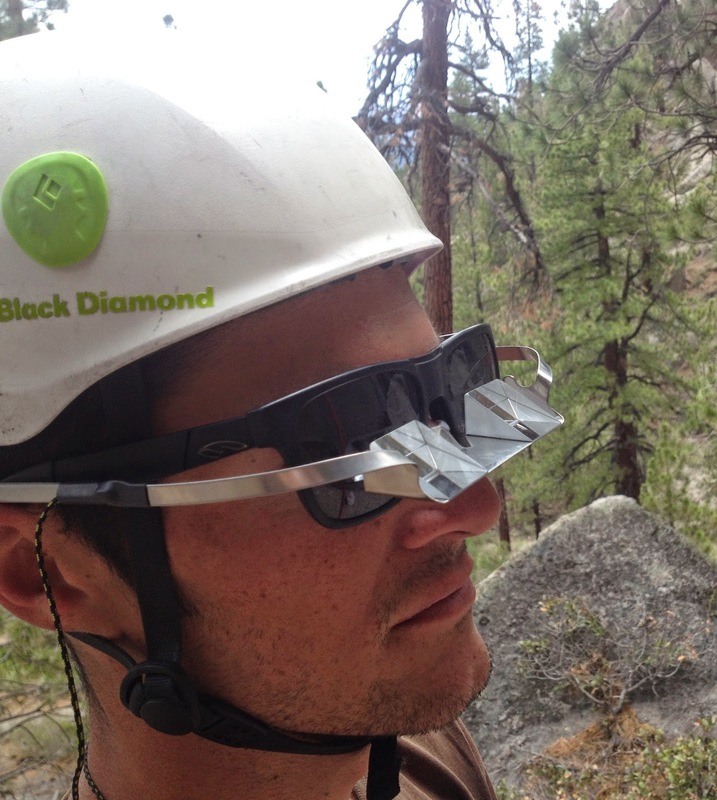 For me the benefit of belay glasses is twofold. First, they drastically reduce neck strain. They make long belays pretty casual. If you or your partner has a project at the local crag, these make the belaying way more bearable. My neck still gets a little sore from time to time because my head is in the same position for much of a pitch and my neck gets tired from holding still, but this is fairly minor. This reduction in neck strain probably has all kinds of benefits for neck and shoulder mobility and longevity. Second, you spend most of the pitch looking at your climber. This leads to less short roping when they're going for a clip, and better coaching. You also get a better sense of what the route is like for your own burn. There are a few models out there, but they all seem fairly similar and work on the same principle. Prisms in the glasses "bend" the light and let you easily see what's above you. I own "Belay Specs" and have been using them since late January. They've probably seen about 30 days of action thus far, predominantly sport climbing at The Owens River Gorge, also at Pine Creek, Clark Canyon, and The Dike Wall. Most of the time at the crag when I'm not using them one of my partners is borrowing them. At first everyone just wants to try them out, but they're soon convinced. Belay Specs come in an orange plastic case. The color of the case makes it easy to find in my pack. There's a cord attached to the ends of the frame arms so you can wear them around your neck like a librarian. The frames are a springy steel that doesn't look particularly durable. Then again, I try to be careful about not scratching the prisms, so the glasses are always on my face, around my neck on their cord, or in the case. So, the durability of the frames is probably not a big issue. A cloth for keeping the prisms clean comes in the case. Belay Specs work nicely with all the sunglasses I've tried. This is an important feature. I've also tried the "Belaggles" but they were a little too tight for my head. Their case is a little more low profile, and looks like the case for a nice pair of sunglasses. The Belaggles frame is plastic and appears more robust than the Belay Specs frame, but I'm not convinced that frame durability is that important. Verticulture, the Outdoor Research blog, published a really cool article/interview with friend and badass mountain guide Sheldon Kerr. Sheldon talks about the disparity women feel between competence and confidence in their skill levels, specifically in outdoor sports. She discusses five tactics to boost confidence in the mountains, and probably most any other place. Oh yeah, these tricks will work for guys too. I am tired. I don't know if I've ever been tired like this before. I've been sleepier, I once fell asleep while belaying on El Cap. I've been more physically tired, I remember hiking out to the car over Lamarck Col and barely being able to put one foot in front of the other. This seems different. There are little muscles in my legs and feet that I didn't know existed before. Most telling, even more than being stoked about what Aaron and I did, I'm just glad we're done. The "Big Four" are four classic rock climbs in The High Sierra. I first saw the grouping and Big Four name in Peter Croft's 2002 classic guidebook "The Good, The Great, And The Awesome". Every other mention of The Big Four I can find references Croft, so the concept might be his (though it turns out there are a lot of other "big fours" out there). And what a concept! Four long 5.10's on beautiful peaks spread along the length of the range. All were first climbed by Sierra heavy hitters. The first ascenionist list includes names like Warren Harding, Doug Robinson, Don Jensen, and Dale Bard. The routes are The Harding Route on Keeler Needle, Dark Star on Temple Crag, The Southwest Face (Harding Route) on Mount Conness, and The Red Dihedral on The Incredible Hulk.